idea - sketch me. CUSTOM PORTRAITS for facebook and twitter profiles. RETRATOS PERSONALIZADOS a mano. Currently we need to show a profile on social networks like facebook, twitter, linkedin ... and we need an image that represents us. Sometimes we want something different, something special and more personal than a simple image. We offer a product made ​​entirely by hand, without any kind of magic filters or automatic image processing. We work directly with the image you send us by email, so the sketch that we give you depends entirely on the image you send us. We´ll send you a high resolution sketch (1920x1920 px). You can use the sketch even to make prints on high quality paper in your own printer. We deliver files in jpg or png format. 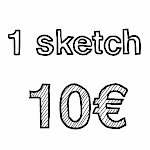 You can use the sketch for personal profiles or as an original gift.